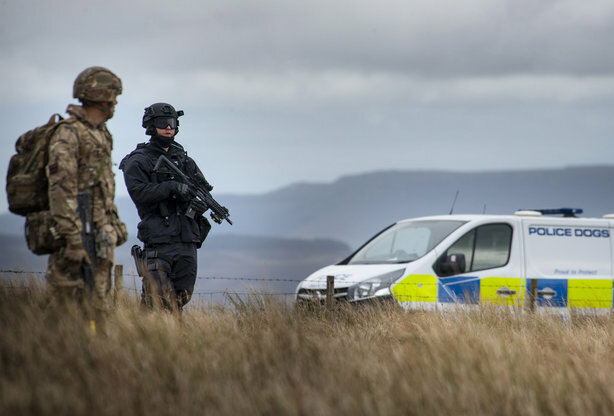 Inter-agency comms were tested as part of a full scale cross-border anti-terrorism exercise between Scotland and the north of England last week, involving government, local authorities and the emergency services. Exercise Border Reiver was a year in the planning and began with a scenario that involved a simulated vehicle attack near the Royal Bank of Scotland’s headquarters in Edinburgh. The three-day exercise, which took place last week, also took in locations in the Lothians and Northumbria. Police Scotland, Edinburgh Council, the Scottish Government and the Scottish Ambulance Service were participants in the exercise while, south of the border, the Home Office, Northumberland County Council, Tyne and Wear Fire and Rescue and Northumbria Police also took part. In a message of reassurance to the public, Police Scotland assistant chief constable Bernard Higgins told people in Edinburgh not to be alarmed if they witnessed blue lights and sirens or heard gunshots. He said the training exercise was partly a response to high-casualty attacks by terrorists using vehicles seen this year, including Westminster Bridge and Parliament in March. Mark Hannan, head of corporate affairs at the Scottish Ambulance Service, told PRWeek that Border Reiver was the biggest training exercise in years and allowed the emergency service to test its responses in a scenario "as real as you could get". He said: "A huge amount of effort had been put into making sure the communications teams were tested to the full, with artificial Facebook and Twitter sites set up, as well as international news channels broadcasting ‘live’ updates and content." Hannan said the exercise was a positive experience for the ambulance service and demonstrated that its procedures could stand up to a similar real-life attack. He added: "Staff across our organisation, from our paramedics responding on the front line right through to our communications teams, were excellent and performed extremely well under pressure." Meanwhile, City of Edinburgh Council were also tested as they responded to emerging reports of an attack on simulated social media sites and BBC news reports, with some of the information deliberately fake or incomplete, in order to replicate the confusion surrounding a real attack. At one stage, the team had to deal with reports of a fake bomb scare below its headquarters, as part of the exercise. A council spokesperson said: "Border Reiver was a worthwhile and challenging exercise for our communications team. It was fast-paced, with developments throughout, necessitating real-time decision-making and close working with colleagues from across the council and partner communication teams." Hannan said that a key learning point in the comms around the exercise for the ambulance service was the need to put more resources into responding to social media. He said: "We’d planned for the huge increase in social media traffic relating to the incident itself, and had provided dedicated staff to deal with the communications challenges this brings with it. However, what we didn’t quite anticipate were the large number of posts we were getting from members of the public asking where their ambulance was for the heart attack, stroke, head trauma or seizure their loved ones were suffering away from the incident itself." He continued: "Obviously the primary port of call for this should be them ringing 999, but we simply didn’t have the time or resource to respond properly to these posts, even to point them in the right direction, during the exercise. A definite learning point, which we’ll look to remedy going forward". The Scottish Government added that it looked forward to the forthcoming evaluation of the exercise.